Happy December everyone! 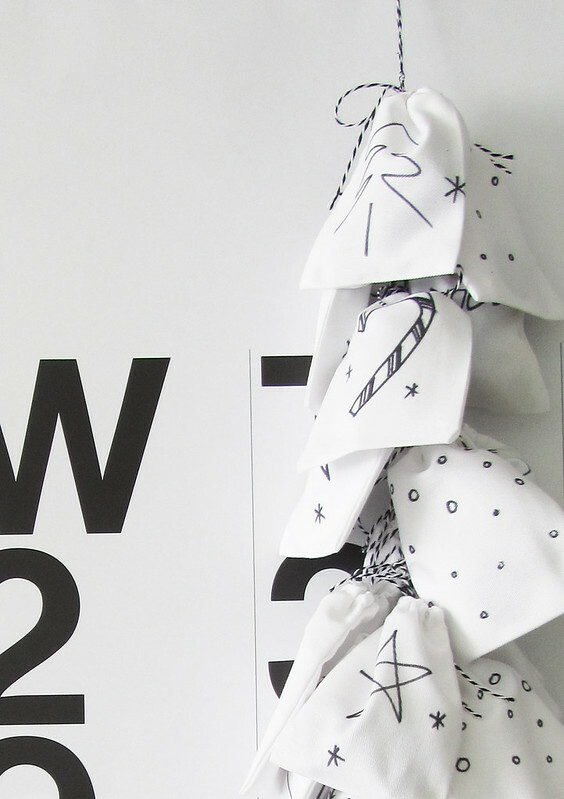 I have another holiday DIY for you, and just in time. 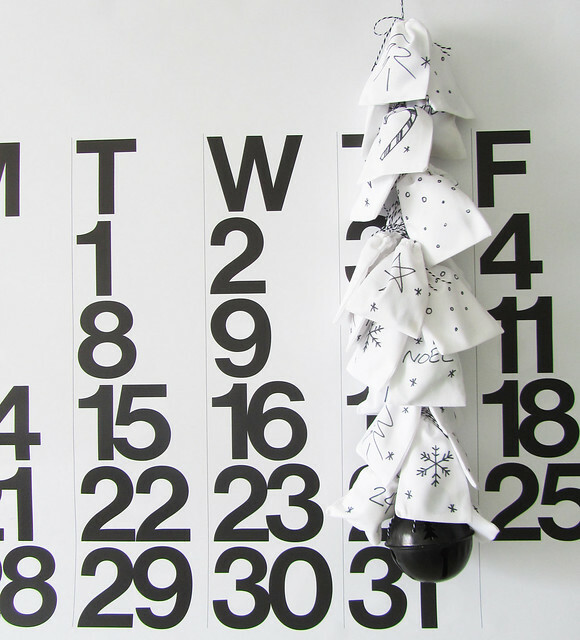 This project is a modern, black and white holiday advent calendar that is really easy and cute! I've been planning this project since last year actually, but I finally got around to finishing it this year, yay! 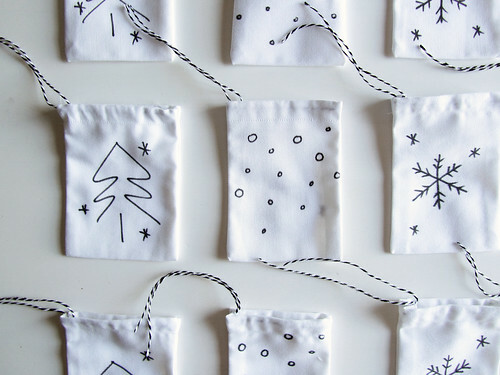 As I mentioned last Christmas, I was inspired by this advent calendar, because the cute pouches gave so much room for toys and goodies, so I just had to find a way to make it a little bit different. Initially, I ordered pouches from an Etsy seller, and they are widely available online. In the end I decided I wanted a pure white bag which was very tough to find. I could have had them made, but I ended up just trying it myself and it was SO EASY. And if you read this blog regularly, you probably know that I loathe sewing. And I'm terrible at it. Like really bad. So, the first thing I did was take my fabric and cut out 24 strips. Mine were about 12 cm x 30 cm. 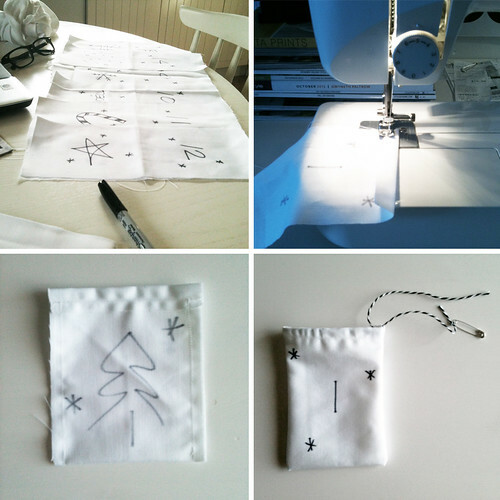 Before I get to the sewing (full instructions are below), I actually decorated the pouches first. I'm not sure why. I guess I figured I would rather not sew one of these and then ruin it. So I did it a little bit backwards. I worked on some sketches before tackling the pouches. I didn't want to have to do a THIRD batch of these. I folded the strips of fabric in half, and using a fabric marker I drew designs on one side of each, and included a number on the back. I made sure to put some cardboard in the middle to prevent any bleed. Now, you don't need to take yourself too seriously here, these are essentially little doodles, but it's fun that way! Kids aren't going to care about how accurately you can draw a reindeer. And if your kids are old enough, they can do this themselves, even better! With all of the illustrations complete, now it was time to sew. Take each strip, and sew a seam on each short end (folding the edges towards the 'bad' side of the fabric). Fold the pouch in half (so that your seams are facing each other, good sides together) and sew along the outer edges just to that seam. To make the 'holder' for the advent pouches I took along piece of the same string and folded it in half, tying a loop at one end that was large enough to go around a door handle. Below the large loop I made 24 little knots, so that between each knot I could tie in one pouch. I wanted to be able to hang this vertically which is great for small spaces. I thought when Ben was a bit older he would love to have this hanging from his bedroom door handle or something. But if you wanted to hang this across a mantle you can just use a longer bit of string and make sure you have enough room between your knots to span the whole mantle. I finished this off by tying a large black bell to the bottom, which I bought years ago at a little shop in downtown Hamilton, but you could really use any sort of ornament, or nothing at all. 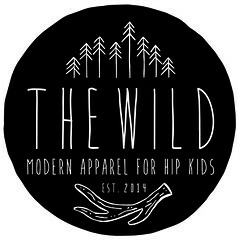 I hope you guys like this project! I will have one more holiday DIY in the next little while. It is a handmade stuffed toy that I'm making for Ben based on one of my nursery paintings. If I EVER finish it, that is. Anyway, if anyone has any questions, please let me know! P.S. Don't forget about my special A & B Stories-readers-only sale! 20% off with code AANDBSTORIES1 in my Etsy Shop! Wow, I am super impressed. It looks so hard, but its not. Your kids are so lucky that you are getting so into the spirit! Cute idea. 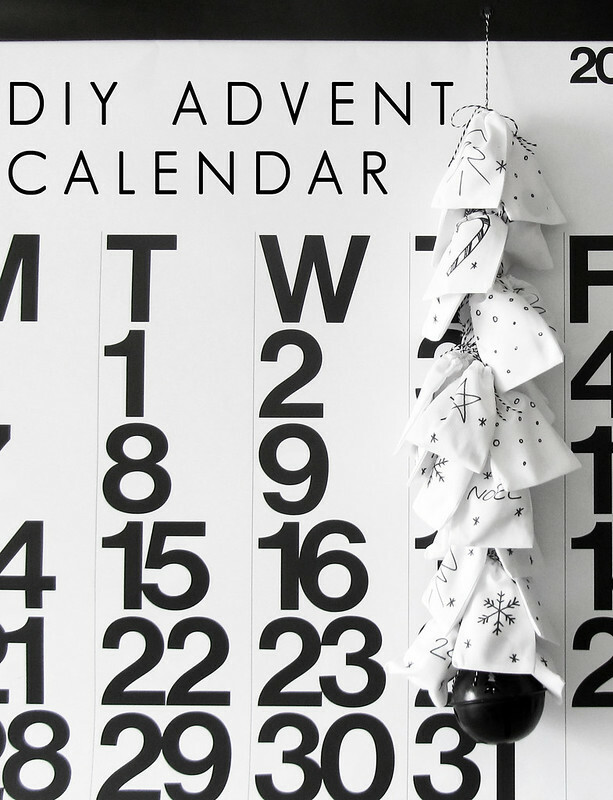 Where can I find the black and white calendar that you use for the Base?